December brings a lot of things to Hawaii. Christmas decorations are put up (if they aren’t already up by Black Friday), the air gets noticeably cooler, and “snow birds,” or cold-weather tourists, start arriving in Hawaii to escape from the frozen winters of other places. Tourists aren’t the only ones who flock to Hawaii in the winter, however, as every year the migration of humpback whales brings thousands of them to the warm, shallow waters of the islands to breed and raise their young. Their relaxing stay in Hawaii results in some spectacular whale watching for anyone who’s here in the months between mid-December and mid-April. Whale watching is a fun activity that’s spectacular, educational, unique, and easy for anyone to enjoy. In fact, if you’re in the right place you can watch the whales from shore, or even a hotel balcony. 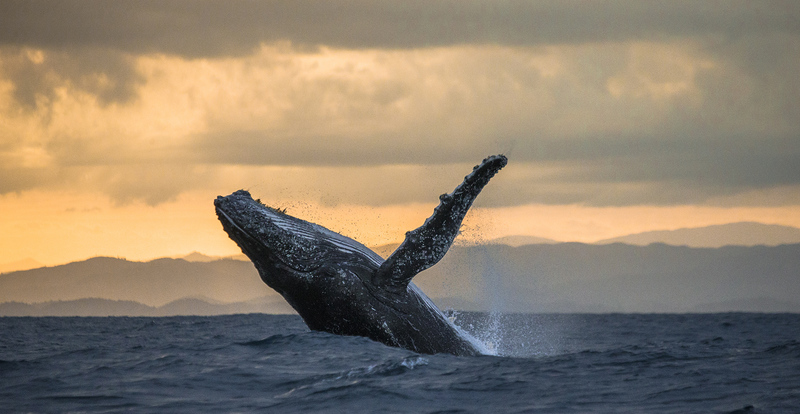 By far the best place to watch the humpbacks is the west coast of Maui, as the area between Maui, Lanai, and Molokai forms a shelf of sorts that has been designated an official Hawaiian Islands Humpback Whale National Marine Sanctuary. The whales like the area because the water is more shallow and protected by the surrounding islands, making it easier for calves to swim in and free from larger predators that might pose a threat. The safety, warm climate, and social environment (it’s breeding season, after all) also makes the humpbacks more playful, making behaviors like breaching and tail-slapping common occurrences throughout the day. 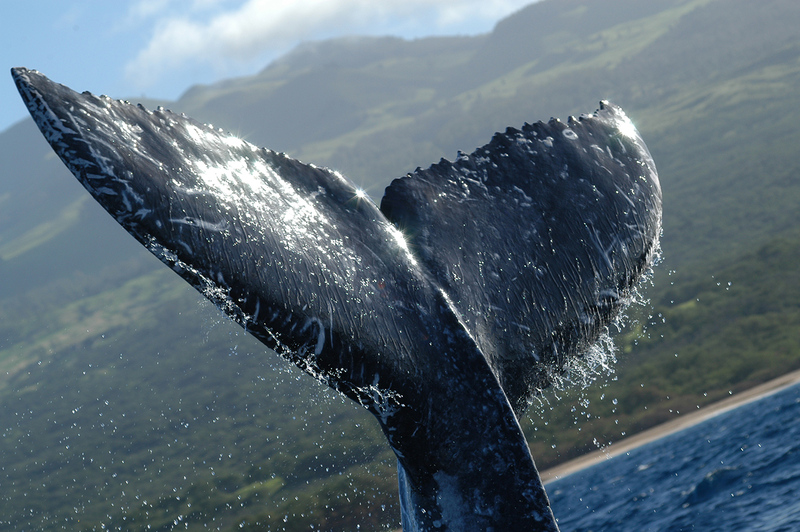 The presence of whales near Maui has been near constant through history, and is the major reason why Lahaina was at one point the center of the global whaling industry. One pushed to endangerment from whaling, the humpbacks now thrive and continue their yearly migration from Alaskan to Hawaiian waters and back. They also continue to bring visitors to Hawaii, but instead of being caught and killed, the whales provide ecotours that contribute to the economy without threatening the whale population. Maui isn’t the only place to watch whales, however, as they can be spotted from Kauai, Oahu, and even the Big Island as well. For the best experience, however, you have to take a guided boat tour to watch whales. Boat tours take you out into the water to get you closer to the whales—but not too close, as you don’t want to harm or scare away the humpbacks. They also generally have a trained naturalist on board to ensure compliance to conservation guidelines as well as act as a guide for whale watchers. Listening to a naturalist is a great way to enhance your experience, as you can learn about various whale habits and behaviors as you see them happen, and even get a background on humpback whale migrations and Native Hawaiian whale-related knowledge before you actually spot any whales. Humpbacks are birthed in Hawaiian waters after all, which makes them locals rather than visitors! While bigger vessels offer more amenities and are more comfortable for non-sailors, smaller boats such as ocean rafts and even kayaks are able to get closer to the whales and are less likely to frighten them away. Whether you choose to go out on a raft or a cruise ship or just watch from the shore, you’ve got a variety of ways to see the humpback whales this year on every island. Great pics. Amazing! We are lucky to have them in Kenya too! It was a great experience.